During the October half term, I was lucky enough to be one of 25 teachers from the NEU to take part in a solidarity delegation to Cuba. I applied for the delegation because, having taught the Millennium Development Goals in numerous geography lessons over the years, I was aware that Cuba was one of the first countries to achieve universal primary education for all. Beyond this, my knowledge of Cuba was somewhat limited before I went. In many ways, it still is, but six days of visiting schools and looking at the Cuban education system has left a deep impression on me. One of things that struck everyone on the delegation was how highly the arts were valued in the school curriculum. In every school we visited, there was a performance where the students shared singing, music, dance, poetry and other expressive arts. It was clear that their performances, which were of a very high standard, were heartfelt and that students were confident in expressing themselves. In some ways, the most surprising thing was how comfortable the teenage boys were expressing themselves through these mediums – in stark contrast to the 14-year-old boys in my year group, the majority of whom who shy away from expressing any sort of feeling or emotion. For myself and the rest of the delegation, there was a realisation that this self-confidence was instilled from a young age, not just through the curriculum but from a culture which gives real value to the arts. We had the privilege of visiting a music school in Havana and a performing arts school in Pinar. The performances there blew us away but the students also follow the full curriculum that is taught in the other schools, but with additional instrumental lessons, dance lessons and more in the afternoon. So, students are able to develop their full potential, for example in music or dance, whilst still receiving a rounded curriculum. All of this is fully funded by the state and the selection process is collaborative between the students, families, primary schools and specialist schools. Students need to have a willingness to dedicate themselves to a particular focus, and to keep up with their ordinary school work. If so, their place is provided free, as is all education in Cuba. This is in sharp contrast with the UK, where students who get grade 8 in piano or violin are usually those whose parents can afford private lessons. In the non-specialist state schools, music, singing and dance are highly valued and form an integral part of the curriculum, from the special schools for the visually impaired to the local community schools. Compare this to the UK, where government funding cuts mean that music teachers are being cut from primary schools and GCSE reforms mean that less and less time is spent on the expressive arts. Indeed, some schools have cut these options entirely. As part of the delegation, we visited two special needs schools. These schools catered for visually impaired students but also for students with other special needs and disabilities too. Again, all of these schools are fully funded by the state. The first thing you notice is the high level of staffing. In one school we went to, the teacher pupil ratio was 1:3, including specialist teachers and an optician. It was so clear that the relationships that the teachers had with the students were built on love. In some ways, this may sound strange in a British context, where there is so much focus on knowledge and exam grades and where teachers feel under constant scrutiny, but in Cuba the whole ethos is different. High levels of education funding and limits on class sizes mean that teachers have the opportunity to develop relationships based on nurture and care, and really knowing their students, rather than based on pressure from above and being held to account. In contrast, in the UK, we’ve seen funding cuts lead to large numbers of redundancies and the first to go are the teaching assistants and other support staff who work with the most vulnerable students, many of them students from disadvantaged backgrounds. Underlying this different ethos in Cuba is the support given to teachers and the value placed on their work in terms of their expertise and knowledge of pedagogy and their understanding of the teaching and learning process. Cuba really invests in this and a large proportion of the teachers we met were educated to Masters or PhD level, again all provided free by the state. If a teacher is struggling, they are given support to improve, including a mentor and a reduced timetable to give them additional time to plan teaching sessions. Their union representatives are part of the team that supports them and can challenge not just the process but judgements on the quality of teaching if they feel these are unfair. Overall, the teachers we met described this as a supportive system where there is a real intention to support improvement, not a punitive system where they felt under increased scrutiny and pressure. Another example of the investment in education is the new curriculum they were trialling in Pinar del Rio, which the teachers at one of the primary schools we visited talked about. This is part of a national review of the curriculum, which is being trialled in a number of provinces before being implemented across the island. The start of the process was two years earlier when the government decided it wanted to develop a new curriculum so it asked the teachers’ union to convene meetings in each school to discuss what teachers felt should be improved. Teachers and their unions are involved from the very beginning, right up to the final decision on the curriculum. The government draws on the expertise of teachers, through their union, rather than a top-down approach where people who have never taught are involved in making key curriculum decisions. The teachers we met were shocked that someone who had never worked in education could be minister for education in the UK. Despite all of the amazing things we saw, the impact of the blockade was inescapable; it was there, right in front of your face. The school buildings were falling apart. In one school, the toilets didn’t have running water, and all schools were desperately short of resources. The university lecturers talked about how far behind they were in terms of IT, and the impact this had on opportunities for undergraduate and postgraduate students. In spite of the acknowledged world class status of higher education in Cuba and the fact that all Cubans can study to Masters level for free, this clearly limited the learning opportunities available in the universities, and in schools. The special needs schools had to share a small number of braille machines between many students because the machines are made, or include components made, in the US. As part of the material support we provided, we took 12 braille machines which we gave to the special schools we visited. But this is a drop in the ocean. Cuba solidarity is raising money to take many more braille machines, breaking the blockade and supporting some of the most vulnerable students in Cuba. 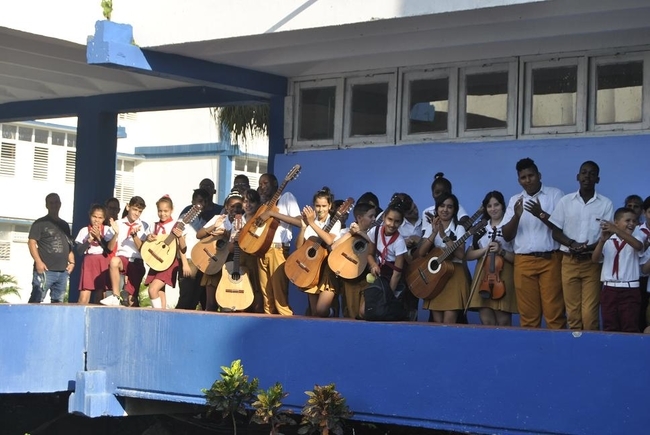 In addition, the Cuba Solidarity Campaign and the National Education Union have launched the Play for Cuba Campaign, to collect new and used instruments for young Cuban musicians. These will be collected in a large shipping container at the first NEU Conference in Liverpool in April, after which they will be sent across to Cuba. Despite all of the challenges presented by the blockade, and they are real challenges, the Cuban education system was a real inspiration to all of us who visited. Students want to be in school because the schools are so inclusive and so positive, and because they offer a broad and balanced education that benefits every student. School is a happy place for them to be and contributes to their development as future citizens of Cuba. When I reflect on the contrasts between education in Cuba and education in the UK, I can’t help but wonder how one government can get it so right and one government can get it so wrong. One fundamental principle underlies it all. They are sharing what they have, rather than sharing what they have left over. Daisy Maxwell is a secondary geography teacher in London.